The relatively easy trek through the enchanting Sham Valley takes you through the Himalayan Homestay villages of Tarutse, Saspotsey, Yangthang, Ulley, Hemis Shukpachan andAng. Tarutse lies at an altitude of 3,527m, just across the Likir River within walking distance of Likir monastery (gonpa). Tarutse and Likir lie under a beautiful mountain that is patterned with horizontal striations. Of the 25 houses here, four offer Himalayan Homestays. The Likir gonpa is believed to date back to the 11th century. Lama Lawang Lhotos later established the Gelugpa order here in the 15th century. This is one of the most active gonpas with 100 monks in residence. Its museum houses a fine collection of old thangkas(sacred scroll-paintings done on cloth that are used in worship). As you walk north over the Chagatse pass (3,610 m), you’re greeted by a lunar landscape that is excellent habitat for the Ladakh urial, while the surrounding mountains are home to snow leopards. Saspotsey is a beautiful village, which is one of the latest villages to join the homestays programme in Sham. The village is located at an altitude of about 3,700m above sea level. Currently nine households in the village are hosting tourists. The village is full of wild roses along the fringes of the agricultural fields. The entire village turns pink in July, when the rose bushes are in full bloom. The villagers are very friendly and cooperative. You can explore the surroundings of the village with local guides who are well-conversant with the flora and fauna. Yangthang is a pretty village located at 3,560m. Three households located in the lower half of the village near the Ulley stream have been offering Himalayan Homestays since 2004. The surrounds are rich in Ladakh urial, an important prey for snow leopards, and are occasionally visited by dhole (wild dogs), wolves and red foxes. The birdlife is also rich. Look for dippers, finches, partridges, golden eagle, lammergeier and many more. You can also see the Eurasian otter along the stream. A 2-hour hike downstream from Yangthang takes you to the famous Ri-dzong monastery belonging to the Gelugpa or Yellow Hat order of Mahayana Buddhism. Built by Lama Tsultim Nema in the 19th century, it is among the largest in Ladakh. The mandala and the dukhang (assembly hall) are adorned with beautiful frescoes depicting scenes from the life of Shakyamuni Buddha. The gonpa owns most of the village land and the proceeds of agricultural produce go to support the 30-odd monks who live here. Ri-dzong follows the rules of monastic life very strictly - the monks do not own anything other than their religious robes and books. Until very recently, it wasn’t accessible by road and hence remained isolated. The area around the monastery is rich in wildlife: the nearby river has rich birdlife and the mountains are home to the Ladakh urial. Ri-dzong’s monks have preached wildlife conservation to local people and played an important role in wildlife conservation. Ulley village offers spectacular vistas of the mountains: they cascade one behind the other as far as the eye can see. Situated at 4,050m, this is the highest village on the Sham route with seven houses surrounded by barley fields. Four of these offer Himalayan Homestays. 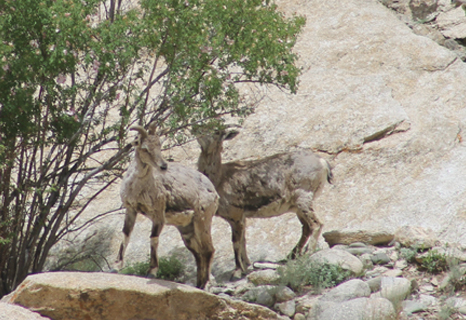 Ulley suffers high livestock losses due to relatively high numbers of snow leopards and wolves. Villagers’ livestock constitutes yaks, dzos, horses, cows, donkeys, sheep and goats. Despite heavy livestock losses due to predators, Ulley residents have made a commitment to not take retaliatory action against these endangered animals in return for being part of the Himalayan Homestays program. In summer, there are excellent opportunities for wildlife spotting wildlife as these mountains are home to marmots, ibex, snow leopards and a variety of migratory birds. Those willing to spend an extra day here could visit the small holy lake surrounded by a marmot colonies. 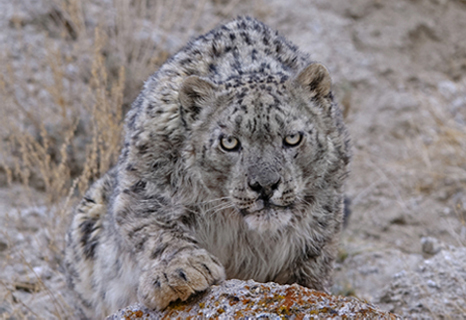 More recently, Ulley has become an important destination for snow leopard tourists in the winter. Hemis-Shukpachan is known all over Ladakh as the village blessed with sacred Juniper trees. Juniper leaves were used widely as incense in monasteries and unfortunately the number of junipers in Ladakh declined over the years. The village community has made a detailed plan to protect the last standing junipers around the village. This is a big village with 140 households, of which eight offer Himalayan Homestays. Apples and apricots grow here. Above Hemis-Shukpachan is the Dakmar Hill (meaning ‘red rocks’) that has a hermit’s abode. The Rinpoche and monks from the Ri-dzong monastery are known to retreat here for meditation. The hills to the southeast and southwest are good habitat for Ladakh urial. Ang is located at about 3,500 m asl. Of the 27 households here, eight offer Himalayan Homestays. The village lies above the larger village of Temisgam that is known for its 14th-century fort. TemisgamFort served as one of the capitals of Ladakh in the 15th century, under the rule of Graspa-Bum. It is one of Ladakh’s important pilgrimage sites. Though most of the fortress is now in ruins, three temples are still in use. The Red Temple is a two-storeyed structure housing a fine 8m high image of Maitreya Buddha. Another temple houses a famous statue of Avalokiteshwara (Bodhisattva of Compassion) that is believed to have divine origins, brought here from Assam. Ang’s main crops are wheat and barley with a few pea and vegetable crops. Most of the agricultural produce is organic. Residents also practice animal husbandry for milk and wool, while donkeys, dzos and mules are common beasts of burden.